Riverside, Calif: The Riverside Camera Museum and the "Camera Shop", 1987. First editions. 4tos., various paginations, illustrated. 41 numbers in 39 issues as follows: No. 7-14, 16-17, 19, 21,-22, 24-32, 34, 37-48, 57, 67, 72/73, plus membership lists and other ephemera. A long but broken run. Began publication as a quarterly in 1970 as mimeographed sheets stapled in one corner. 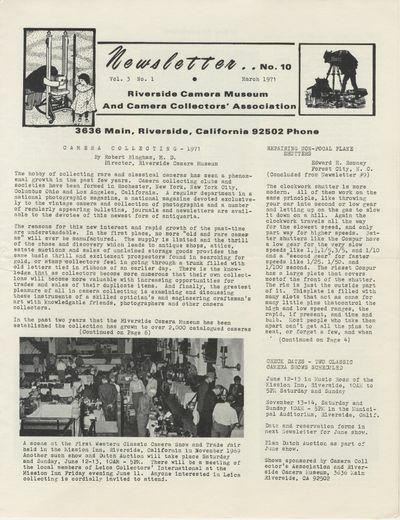 By issue number 10 the name changed to NEWSLETTER: RIVERSIDE CAMERA MUSEUM AND CAMERA COLLECTORS' ASSOCIATION, and the format changed to folded brochure with photographic illustrations. With issue number 21, the title changed again to NEWSLETTER OF THE WESTERN CAMERA COLLECTORS' ASSOCIATION. And with issue number 28, the title changed once again to THE PHOTOGRAPHIST: JOURNAL OF THE WESTERN CAMERA COLLECTORS' ASSOCIATION, AFFILIATED WITH THE UNIVERSITY OF CALIFORNIA MUSEUM OF PHOTOGRAPHY, and the format changed to glossy photo-illustrated wrappers, and the paganation increased from a few pages to approx. 24 per issue. Initially, this publication was a vehicle for selling and swapping photographic equipment between members. By 1974 articles of historical interest were predominating the contents.